Don is a very good economist, and he is concerned that special interest tax breaks can misallocate resources the same way that spending subsidies do. I agree. But I’m also concerned that tax breaks and spending subsidies have different implications for the size of government, which is where I part ways with Don and the president. The following Tax Policy Matrix helps sort out which sorts of tax cuts make economic sense when government size is also a consideration. The government distorts the economy and reduces GDP through both its taxing and spending actions. One reason is that both taxes and spending cause individuals and businesses to change their behaviors and reallocate resources in suboptimal ways. The table has columns for tax and spending distortions. It also has a column for government debt because running deficits today may translate into higher levels of distortionary taxes tomorrow. The table includes two Starve-the-Beast scenarios. “With Starve-the-Beast” means that tax cuts will reduce government spending to some extent over time. A narrow tax base shot full of loopholes creates allocation distortions, but if starve-the-beast works that sort of tax base also limits the government’s size creating a counterbalancing benefit to GDP. In the short run, starve-the-beast may or may not work. Bill Niskanen says that it does not, but I think the effectiveness of it changes over time as political culture changes. In the 1980s and 1990s, policymakers took corrective actions when deficits rose, but the revival of Keynesianism in recent years changed the political culture and, for a while, nullified the fear of deficits for many politicians. 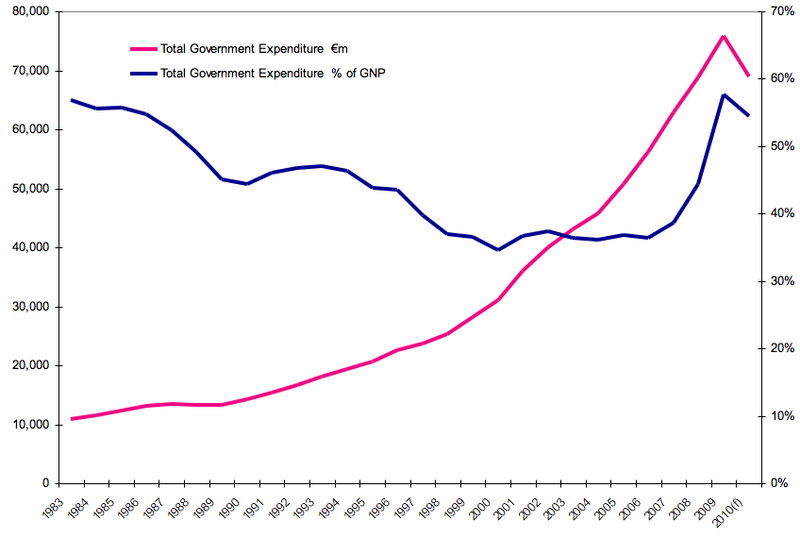 In the long run, it seems obvious that the inflow of tax revenues to the government is a hard check on spending because there are financial market limits to government borrowing. Row 1. The government starts off with a balanced budget and with tax and spending systems that cause medium damage. Row 2. The government cuts taxes $100 by way of a loophole. Tax distortions rise because marginal tax rates are unchanged and we’ve added a new distortion. Higher debt likely pushes up future tax distortions. This appears to be a poor policy choice. Row 3. The government cuts taxes $100 by way of marginal rate cut. Tax distortions are reduced, which increases economic growth. The downside is higher debt. This may or may be a good policy depending on the quality of the tax cut. If the cut is to a very distortionary part of the tax code—such as the corporate income tax rate—this policy could make sense. One reason is that the deficit increase might end up being quite small because of the positive economic response to the pro-efficiency tax cut. Row 4. With starve-the-beast operational, a special interest tax cut becomes a bit of a closer call. Tax distortions and debt rise, but government spending falls somewhat, so the net effect on the economy is unclear. However, I think there are considerations here aside from economics. Special interest tax breaks—such as the ethanol tax break—are troubling because they represent a corruption of the law, an affront to the American ideal of “equal justice under law.” So just on that basis, I’m against special interest breaks, and indeed am in favor replacing the current code with a flat tax. Row 5. A pro-efficiency tax cut is very likely a winner if you assume that starve-the-beast is operational. Tax and spending distortions both fall, although there is a modest increase in debt. So far we’ve left out the most important fiscal tool available to policymakers—spending cuts to unneeded and damaging programs to reduce government harm to the economy. The best policy choice would be to combine pro-growth tax cuts with spending cuts to harmful programs. That would reduce government distortions on both sides of the budget, and thus unambiguously increase GDP. In sum, without matching spending cuts, tax cuts may or may not make sense depending on the type of cut and whether reducing Uncle Sam’s diet will force him to slim down in subsequent years. But it is a fiscal policy win-win to match spending cuts with cuts to the most damaging parts of the tax code. The Obama administration is showing interest in reforming the U.S. corporate income tax. That’s good news because a lower corporate rate would boost domestic investment, which in turn would generate more jobs and higher wages and incomes. A lower corporate rate would also attract more inflows of direct investment from abroad—foreign-based businesses expanding their plants and building new plants in the United States. I updated this chart from our book, Global Tax Revolution. It shows that during the 1980s, the United States enjoyed higher inflows of foreign direct investment (FDI) than outflows. But since then, the pattern has reversed—our companies are now investing more abroad than foreign-based companies are investing in the United States. (Data is from the BEA). There are numerous factors that affect these flows, but there is no doubt that taxation plays an important role. If we cut our corporate tax rate, we would attract more investment (move the black bar upwards), which would be good for the U.S. economy. There is an important caveat with the data, however. A large portion of FDI involves mergers and acquisitions. If a foreign company takes over a U.S. company, that’s an investment inflow. If such a takeover is a market-driven event that increases efficiency, that’s fine with me. However, there is evidence that foreign companies are taking over U.S. companies because we have anti-competitive “worldwide” corporate tax rules. So the solution is to move to a “territorial” corporate tax system and substantially reduce the federal corporate tax rate. That way, we wouldn’t artificially encourage the takeover of U.S. firms, while also attracting larger inflows of job-generating greenfield investments. A final note on the chart: it clearly shows that U.S. international investment has exploded in magnitude over the last couple of decades. That explosion has greatly increased the importance of having a competitive corporate tax code. So good for the Obama administration for looking into possible reforms.